Are you ever in the middle of a huge pile of cored beads and you just are having a super off day? I’ve been hoarding my sterling, copper and brass rivets for a while now, figuring that at some point I’d finally figure out what to do with the perfectly fine metal pieces after I’d gone and broken the glass off them. Many Native American and other heritages are rich with fine woven beadwork. This tutorial teaches a stitch called Brickstitch, which can be used to make everything from these earrings to more elaborate shapes. Start by practicing these instructions, and soon you’ll be able to make so many beautiful beaded items. This pearl and ribbon number is so simple, you can make it in less than 30 minutes, and it requires so few materials that you’ll be in and out of the bead store in no time flat. Using a figure eight stitching pattern, groups of beads are gathered together to form shared rows that can be increased and embellished in every direction with ease. The unique shape of a basic right angle weave unit allows for endless possibilities in three-dimensional beadwork. This one is simple, and I mean even-if-you’re-not-a-beadweaver simple. I’ve given you steps, pictures and even cross-section illustrations, so you can do this.I completed this one in an hour and It’s unique and interesting, and you can make the whole thing for about $10 and an hour of your time. The Renaissance Diamond Chain Collar is here! I had the idea for this collar floating around in my head for quite a while, and I wasn’t quite sure how I was going to stitch it up. Then when I wrote up my tutorial for the diamond chain a few weeks ago, I realized that all the materials were sitting right in front of me! 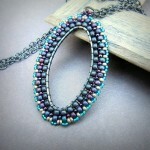 It's not easy being a bead goddess!